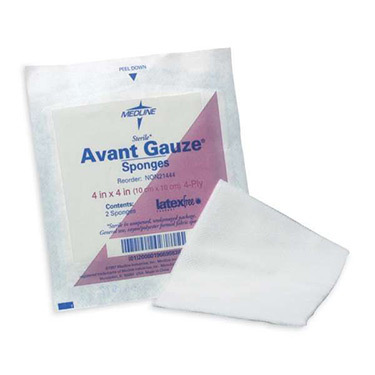 Avant Gauze is Medlines standard non-woven dressing and compared to traditional cotton gauze, Avant Gauze helps to reduce the amount of lint that is produced and is less traumatic to fragile granulating wound tissue because its virtually non-adherent. It also has significantly faster wicking ability which promotes a healthier healing environment. These sponges have the perfect balance between strength and absorbency in this rayon/polyester blend gauze. Non-sterile. Available in 2 x 2, 3 x 3, and 4 x 4 inch sizes in both 3-ply and 4-ply thickness.